Wide Open Walls celebrates public art in a big way, and nowhere is it bigger than at Sacramento State, where artists have spelled out S-A-C-R-A-M-E-N-T-O in letters 15 feet tall. 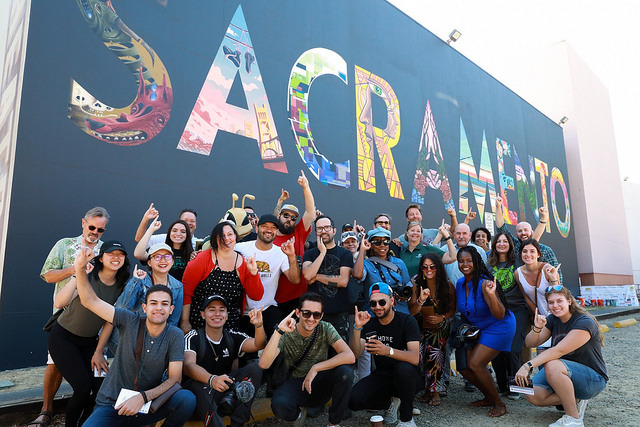 It served as the city’s signature mural for the 2018 Wide Open Walls festival – named the Sacramento Mural at Sac State – and an anticipated destination backdrop for selfies and other could-become-iconic photographs. “This mural will be a point of pride for Sacramento State for years to come,” says University President Robert S. Nelsen. Twelve well-known artists, mostly locals with fine art and street art credentials, on Thursday, Aug. 9, began painting their visions in the shape of letters spelling the city's name on the west side of Shasta Hall, home to Sac State’s University and Playwright’s theaters. The mural was virtually complete in time for a celebration on Aug. 18. The festival continued through Aug. 19. “Public art is there, stares you in the face. You have to see it. And all of a sudden, a conversation develops in meaningful ways,” Matsui said to the nearly 100 people gathered for the event. Sac State’s Paint Shop crew prepped and painted the wall dark charcoal, creating a 4,000-square-foot canvas for the giant postcard-like mural. Their bold and colorful creations will be completed by the team’s 12th member, Jeremy Stanger, who was to paint 3-D drop shadows on each letter. David Sobon, owner of DSA Events, launched the Sacramento Mural Festival in 2016, inviting artists to transform walls and neighborhoods throughout Sacramento. The event was recast as Wide Open Walls the following year. The 2018 festival brought together more than 40 artists – local, national, and international – to provide additional color and excitement to the city’s landscape. Williams’ piece, called Home in Sacramento, is an interactive animation. The students’ art project is Leave Your Mark, a projection with digital animation and panoramic photography. The student-artists are Rebecca-Lyn Standley, AJ Adams, Camille Grunder, Derrick Armbrust, Jacob Barrios, John Klaiber and Shara Poole.